(Fort Myers, Florida) DC continued their season with a two game match up a very notable St. John’s. St John’s started off hot in the second inning, plating 6 runs in the second inning against Will Bohlman. St. John’s stayed hot, adding 2 in the 4th and 6th, and an extra insurance run in the 5th and 7. The Jackets did their best not to roll over, but they could only put together 4 runs of their own against good pitching, with 1 coming in the 3rd, and 3 coming in the 4th. Zac Brazen, Kody King, and Parker Houk all threw for the Jackets along with Bohlman. Troy Konwinski and Jude Neary both had multi hit games, while Nate Kaffenbarger and Daniel Tomalak both had extra base hits. Tomalak’s double was his first collegiate hit. The Jackets dropped the first game 12-4. The second game the Jackets were able to limit St. John’s offense, but they couldn’t figure out how to put runs on the board for themselves. The Jackets got a great start from freshman Cohen Nies, who was able to throw 5 innings of 1 run baseball. Nies was followed by Grant Curavo and Cody Nelson, and finally freshman Tyler Hines. Hines was able to strike out 2. The Jackets only had 3 hits total this game, and two being the first collegiate hit for Jon Brown and Lucas Thomier. Ben Bucklew had the other hit. 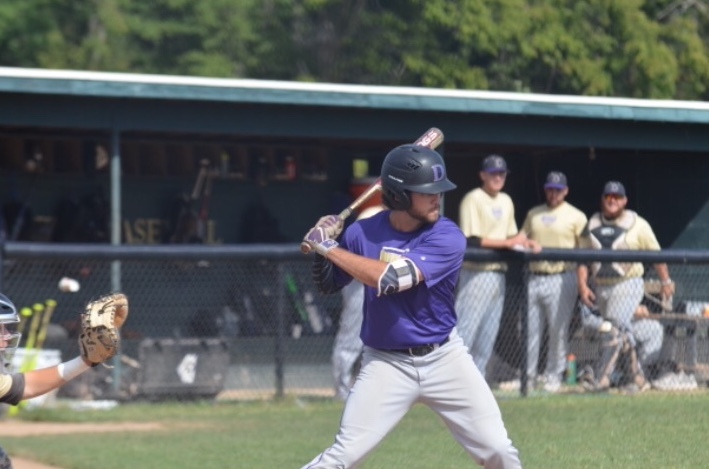 (Fort Myers, Florida) The Jackets were not able to finish there trip as they wanted with a double header against another tough opponent in Alvernia University. Paris Creek got the nod for the first game coming off of 4 days rest. Alvernia was able to jump out to a 1-0 lead, but the Jackets answered back. Alvernia’s bats stayed hot though, putting 3 on the board in the 3rd, 4 in the 5th, and 2 in the 6th. The Jackets were able to get a rally together in the 5th, scoring 4 of their own, but it was not enough, as the Jackets fell 10-5. Paris Creek was followed by Tyler Hines, Jack Powell, Parker Houk and Kody King for the pitchers. Nate Kaffenberger, and Jude Neary both had multi hit games, with Kaffenbarger hitting a double. The Jackets came into the second game wanting to end the trip on a high note. The second game was more of a pitchers duel. Alvernia’s hot bats were quiet until they scored 1 in the 3rd and 4th, and 2 in the 5th. The Jackets put together a 2 run inning in the 4th, but that is all they were able to do. Jon Brown got the nod for the Jackets, and threw extremely well. He threw 4.2 innings, giving up 2 runs, but striking out 5. He was followed by Micheal Reese who threw 1.1 innings and struck out 1. Everitt Kissel was the only Jacket with multiple hits, and had one RBI. Next Post:Gun Control: Is it Needed?